I lost my son to opioid addiction. No parent should have to live this nightmare. 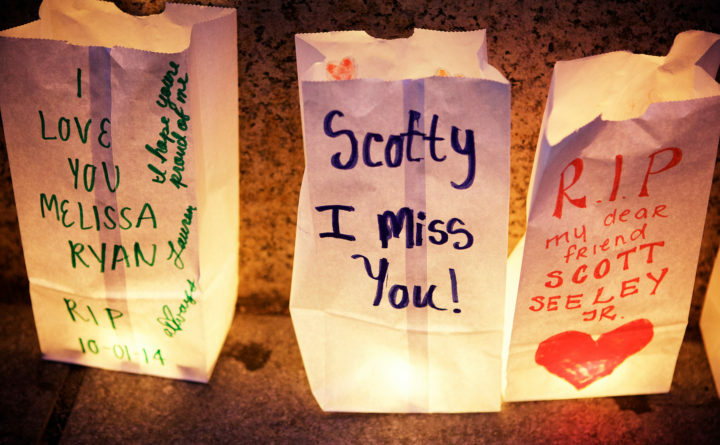 Lighted paper bags stand as memorials to those lost at a drug overdose victims' vigil in Portland's Monument Square, Aug. 31, 2015. A parent’s worst nightmare is the loss of a child. Even before the child is born, you begin to worry. When they are babies and asleep, you go into their rooms regularly to make sure they are safe. As they become wandering, adventurous toddlers who show no fear, you must keep an ever watchful eye on them. As they grow up, foremost, you want them to be happy. My son Jonathan was a happy child. He did the things that many little boys do. He loved constructing Lego buildings and then demolishing them. He was a big fan of Teenage Mutant Turtles, dressing as one for Halloween. He played Little League baseball and enjoyed being on two championship teams. We shared one accomplishment — breaking a car window hitting a foul ball. I did it in high school when I was the team’s manager. The seniors were on a class trip and we were short on players, so I got to be in a game. Jon achieved the glass-smashing in Little League. We bonded over that shared experience. Jon played varsity soccer for four years, but he excelled the most in high school track. He won several medals at regional and state meets. Somewhere along the way, soon after he started college, he became entangled in the dark world of addiction. This coincided with his mother being diagnosed with cancer. He turned to drugs to ease the pain he was feeling. He struggled mightily over the next several years. He often showed that buoyant Jon of earlier years but also a more subdued young man. He saw counselors, he was hospitalized twice, and he exercised obsessively to try to keep his body and mind healthy. After college, he got a good job and seemed to be going on the right track. Then five years ago this week, his girlfriend informed us that she had gone to Jon’s apartment in Belfast and his car was there, but he apparently was not since his door was locked and no one answered. She contacted my daughter the next day when she still could not get in contact with him. My daughter contacted me. Fear gripped me tighter than my hands on the steering wheel as a I sped to Belfast. He had not showed up for work on the previous day and no one had been able to reach him. I met with his landlord to get a spare key to the apartment, saying I was concerned about his well-being. I went to the apartment, but the door was also locked from the inside. His car was in the driveway. I called out repeatedly for him with no response. The apartment was on the second floor, and there were no windows that were accessible. I finally summoned the strength to break down the door. And there was my son, slumped over at his desk. In front of him was a picture of the two nieces he adored. He was cold to the touch. I desperately dialed 911 but knew it was too late. Time stood still as emergency personnel and police arrived and asked questions to which I had few answers. Opiates had claimed not just another life — but the life of my son. He was only 26. There is still a public perception that people who are addicted to drugs are not worthy of our compassion or attention. I remember that a news article was written after Jon’s death (no names were used) that pointed out that two people had overdosed over the weekend in Belfast. In the comment section after the story someone posted “good riddance” that two druggies had died. And that is a common refrain from some people. In the five years since Jon died, the state has done little to effectively deal with this greatest crisis of our time. We are losing a generation of our children. The governor has stymied efforts to expand MaineCare, which could help people struggling with addiction by making rehabilitation services available for them. Last year in Maine, 418 people died from drug overdoses. These are preventable deaths. There is no single solution, but it will take the collective will of the people and our elected leaders to do something. There is no reason other parents have to experience this never-ending nightmare. Stephen Betts is a reporter for the Courier-Gazette in Rockland.